If you were to pre-order Super Scribblenauts, Sonic Colours and Nine Hours, Nine Doors, Nine Persons from Gamestop you'd have enough items of clothing to walk the streets as a headphone-wearing Sonic the Hedgehog with a metal watch. If that's not your idea of value for your pre-order money, Gamestop has something a bit more practical lined up. 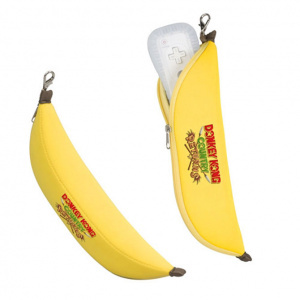 Sticking your name down for Donkey Kong Country Returns will net you a soft pouch shaped like a banana, perfect for keeping your Wii Remote safe inside. The pouch even comes with a small metal clip on there, perfect for attaching it to your house keys or any other portable item you may associate with Wii Remotes and bananas. Head over to the Gamestop website to secure yourself one of these bright yellow bonuses now. I would love to have one of these! bananas ftw! "or any other portable item you may associate with Wii Remotes and bananas." Shame it's not just a regular banana. I need that potassium! @JumpMad as do I, can't get bananas that aren't already yellow in Korea. Hopefully I'll have a Wii in time to pre-order this. P.S. I love the box are for this game, has the whole the SNES DKC vibe to it. I was gonna pre-order the game at Gamestop anyways when I go to pre-order Kirby this week, but yeah it seems pretty interesting. I am probably just gonna hang it on my wall with a tack instead of using it for a WiiMote lol. I'm not overly excited about a yellow sock I will never ever use. So pre-ordering from elsewhere. Oh wow. Enter a new era of phallic jokes. "How do you get to your Wii?" "Oh it's easy, I just peel the banana." @21.CaptainDingo: Do you want to play some Donkey Kong, or are you just happy to see me? Those look like body bags for mice. I wonder why Nintendo doesn't release special editions. Epic Mickey gets one but love for DKC...Mario or Metroid!? What gives? I think gamestop just got my preorder. I was gonna pre-order either way, but I guess it's a bonus. Lol, I was going to pre-order it anyway, hooray for bonuses. man all these neat preorders. Kirby should have a quilt of kirby that you get if you pre-order his game. I'd love to get many of the practical ones, for I need new headphones and a watch (maybe a hat?) but I don't know how to feel about this one. Since when does anyone NEED a wiimote holder!? What is the purpose? just put it on the shelf with the console or in the basket with other remotes or whatever! I also don't like the idea of calling the game with an ending word "returns" because it still doesn't feel right to say the series is returning, like breaking the 4th wall or something. It seems a little uncreative. 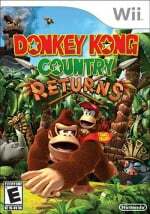 I guess they can't say DKC4 because its not really the 4th one, more like a homage to it, and that would leave out the 64 one. They're kinda screwed into a corner with the title, but they could have come up with something better then "Returns." Look, I love Donkey Kong, but I could care less about a pouch to put a sinlge Wiimote in. I mean, you can't even use it while it's in the pouch! What I think looks nice is that figurine or the plush of Donkey Kong, NOT a banana pouch for a Wiimote that I'm gonna, what, carry with me and keep safe while I stroll about the town?